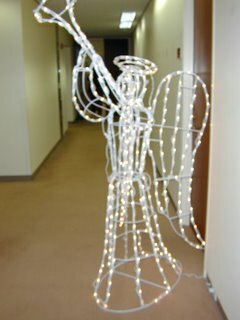 Much to my amazement, the Giant Tacky Angel was adopted by one of the caterers from my office's holiday party last night. 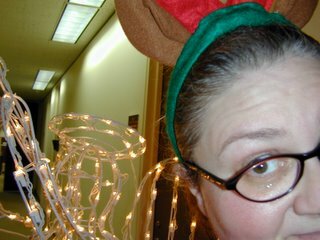 The caterer was quite smitten with the angel's rickety, misshapen form and partially burned out lights. And so, gleefully, I gave him away. I hope that guy had a car because that damn thing is ginormous. Very sincerely, this gent was tickled pink with the angel. He said his grandkids would love it. And I hope they do. He thanked me repeatedly as we dismantled and packed the monster up. It made me feel good to make someone else so happy. It also made me feel good to know I wouldn't have to drag that friggin' thing down M Street to my car. Of course, it would have made for a helluva story at the DC Blogger Meet-up last night. Hello, my name is Merujo, and this is my six-foot illuminated angel. How ya doin'? yay. 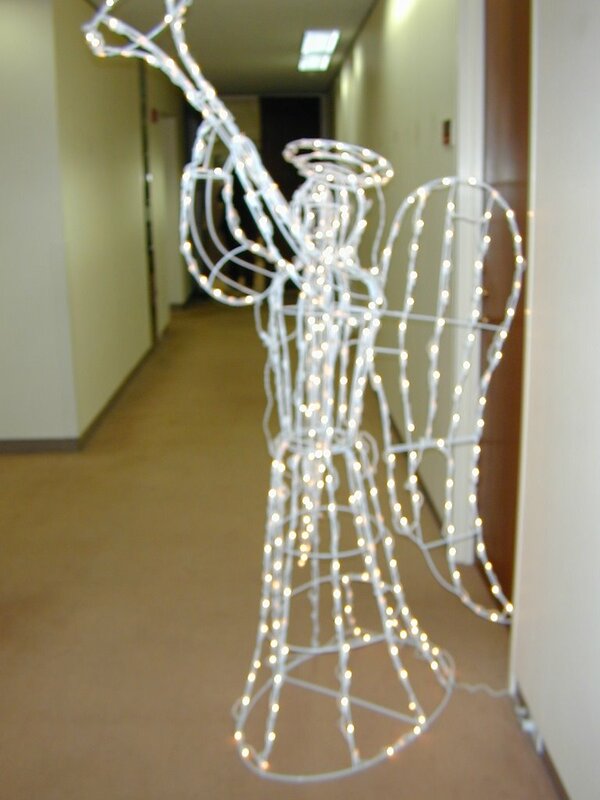 i'm glad the giant tacky angel has found a home where it will be loved and appreciated as it is. You could have taken it to Baltimore and left it (see my blog) and no one would have been the wiser. Good thing I bummed a ride from you to the happy hour that night. If I hadn't laid claim to the front seat of your car, that thing would have come home with you that night. It's a Christmas miracle. Amen to all three of you! I do like the thought of a Baltimore "angel dump" in Hampden, but it still would have required a drag down to my car. And then, Always Write would have been smooshed under the considerable weight of its glorious hideousness. Congrats! I had a feeling it would work out.